Here on Earth few people are familiar with the concept of planetary obliquity, but we all feel its effects: Obliquity measures a planet’s orbital tilt with respect to its star, which is what creates Earth’s changing seasons. Now, astronomers are proposing that shifts in obliquity could do even more. According to new research published in Nature Astronomy, when a planet’s rotation and orbit line up just right, they can tip the world sufficiently askew to force it farther out or closer in to its star. The findings may help explain an almost decade-old mystery lurking in the thousands of worlds found by NASA’s planet-hunting Kepler space telescope. As substantial as seasons may be to our lives, they have often been treated as scarcely more than rounding errors when considering the forces that shape an entire planet from core to crust to cloud top. That, combined with the fact it is presently very difficult to measure an exoplanet’s tilt, has led most astronomers to mostly ignore obliquity when they model the evolution of planetary systems. Yet in their study, co-authors Sarah Millholland and Greg Laughlin, both of Yale University, reveal obliquity-driven tides can have dramatic effects. “Large obliquities make stronger tides, and tides make the planet move,” Millholland says. Before Kepler, astronomers knew of only a handful of exoplanetary systems, with most containing only a single known world. Based on studies of our own solar system, they expected many of those planets to be paired in resonances, an effect in which gravitational interactions between worlds ensure their orbital periods occur as a ratio of small whole numbers. For instance, an outer planet in resonance with an inner one might make a single trip around its star for every two revolutions by its closer-in companion, forming a so-called 2:1 resonance. The result would be both worlds forming a very stable configuration in which they pass each other at the same place in their orbits every time. Such resonances, it is thought, arrive early in planets’ lives, arising as worlds are jostled together inside their formative disks of gas and dust around newborn stars. Our sun’s planets do not fall under these patterns, but many of their moons do. Several satellites of the gas giants are bound together in such resonances. “This happens much more often than would be expected by pure chance,” says Douglas Hamilton of the University of Maryland, College Park, who was not involved in the new research. Kepler, it turned out, would be particularly adept at detecting multiplanet systems in which worlds orbit cheek by jowl, packed close together in resonant configurations. But when the first batch of Kepler’s worlds was released in 2010, astronomers quickly realized something was amiss. Paired planets proved common, but most were ever-so-slightly out of sync—just wide of a resonance’s bounds, passing one another a little slower or faster than expected. It seemed as though some unknown force had pushed the paired planets apart. “That was an exciting result,” says Darin Ragozzine, an astronomer at Brigham Young University who studies exoplanets and helped uncover the mystery in 2011. Almost immediately, astronomers pounced on the puzzle. According to Ragozzine, who was not part of the new study, scientists suspected planets paired up into resonances early before something interfered. Suspects included asteroids pushing on the planets, pressures created as the disk’s gas dissipated and tides raised by the star’s gravitational pull, but none of these seemed to do the job—at least not until Millholland and Laughlin turned their eyes toward obliquity. Standard formation theories posit that when planets are born, their equators are pointed toward the star and their poles point straight out of the disk that surrounds them. Interactions with other objects over their lifetimes can change their obliquities, tilting them over slightly or tremendously. Earth currently has a tilt of 23.5 degrees, thought to be fostered by the influence of its moon. Uranus, in contrast, is tilted over at 97.9 degrees with its poles lying on the same plane as the sun—presumably set askew by some world-shaking wallop long ago. Whatever its fundamental cause, a planet’s tilt can exhibit further changes as it rotates, much like the oscillations of a spinning top. Over the course of some 40,000 years, Earth’s obliquity waivers between 22.1 to 24.5 degrees. At the same time, the pole itself does not stay in the same place; it also wobbles slightly like the base of a top traveling across a plate in an approximately 26,000-year cycle known as spin precession. All of this happens while the planet travels around the sun in an ellipse. But there is more! The ellipse itself is also shifting slightly, keeping the same distances but revolving ever so slowly around the star. Laughlin’s preferred demonstration of this hard-to-grasp relationship is a simple wooden top set spinning on a dinner plate, in which the top acts as a planet and the plate as its orbit. By wobbling the plate back and forth at exactly the right speed, one can keep the top spinning long after it would have otherwise stopped. The wobble of the plate and the spin of the top become linked when they occur at the same speed, so that a change in the plate’s movement affects the top. “It’s a tangible analogy that is really close to what the planets are experiencing with spins and orbits,” Millholland says. For planets, tilt-driven shifts to their orbits happen early in their lifetimes. In a span of perhaps 10 million years, the gas in their formative disk disappears, gobbled up by growing giant planets or blown away by stellar winds. With little to no remaining gas to push against, planets cease to drift and settle into stable orbits; this stabilization acts to slow a planet’s spin precession, stretching out how long that precession takes to complete a revolution. Finally, that slowdown slowly forces the planet to tilt sideways more and more. Millholland and Laughlin’s efforts may be the first steps necessary to solve the Kepler mystery, but are unlikely to be the last. “Obliquity is a thing that people neglected because they despaired of ever observing it,” says Daniel Fabrycky, an astronomer at the University of Chicago who did not take part in the work. He is convinced this new study will spur more astronomers to take another look at the effect of leaning planets, which in turn could reveal further complexities as yet unaccounted for. Changing how a planet leans toward its sun has several important planetary effects. The tidal pull of a star is enough to create a bulge around a nearby planet—and the Kepler planets are all sufficiently close to experience such effects. The movement of material inside the planet generates heat, warming the world’s interior and potentially powering volcanic eruptions and other geologic phenomena. That is what happened to Io, a moon of Jupiter. Although it does not possess a high obliquity, its elliptical orbit massages the moon’s interior, thanks to Jupiter’s gravitational pull. The result is a tiny moon that is the most volcanically active object in the solar system. That does not mean most tipped-over planets look like Io, but “it’s something that could easily be going on," Laughlin says. 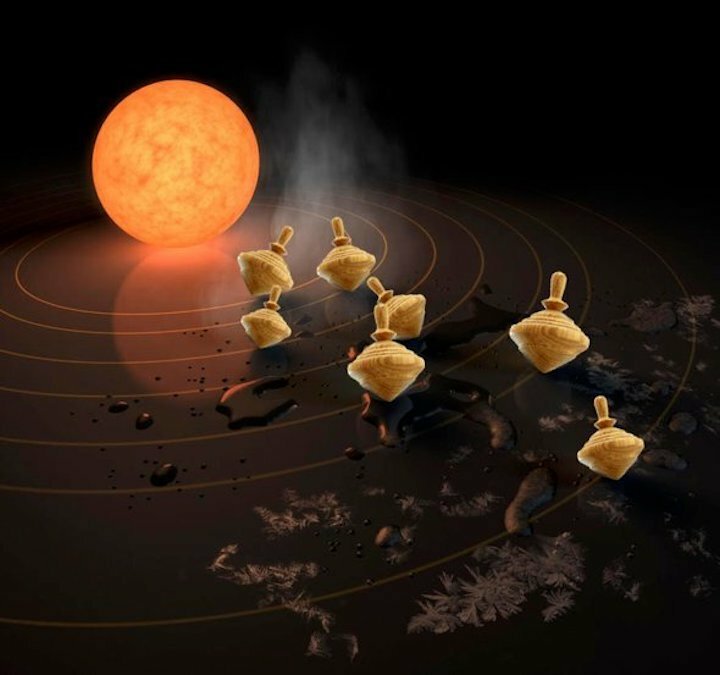 Although both Ragozzine and Hamilton are optimistic about the results, Fabrycky is not completely certain the new findings will explain all of the strangely piled planets that Kepler revealed. “I’m not entirely convinced that it will explain everything, but they have demonstrated it’s an important mechanic,” he says. Laughlin notes it is not meant to account for every planet with an orbit just off-center. After all, some planets would end up in such orbits by random chance. Instead, he says the theory is meant to explain the excess of planets Kepler revealed. By itself, it will not allow researchers to point to a single planet and say whether or not its orbit comes from random chance or whether its tilt has pushed it aside. Think again of Uranus and its off-kilter spin—likely due to a chance planet-walloping impact, not a subtle inevitability of celestial mechanics. Millholland and Laughlin remain optimistic. "We think this explains the mystery that’s been bothering planetary scientists for the last few years," Laughlin says.